Enzo Casino UK | Read Full Review & Claim Unique Welcome Bonus! Enzo Casino is one of the numerous Game Tech brands that hit the world of online gaming in 2016. As a Game Tech brand, Enzo casino is open to players from across the world including the UK. This might sound weird since Enzo Casino does not have a UK license. However, with just an operating license from the government of Curacao, Enzo casino is open to players from Europe, Africa, and many other regions. Its wide coverage is seen in the fact that Enzo Casio supports multiple languages. Hence, players can easily select from English; Deutsch; Espanyol; Norsk; Italanio; Suomi and many other languages. Likewise, Enzo Casino has a very beautiful design. At a glance, you would definitely love the look and feel of the casino lobby. Furthermore, Enzo Casino displays banners of some of their most attractive features including bonuses, newest games and many more. Enzo Casino currently has more than 500 games in their collection. Also, these games are carefully selected from more than 20 of the best game vendors in the industry at present. 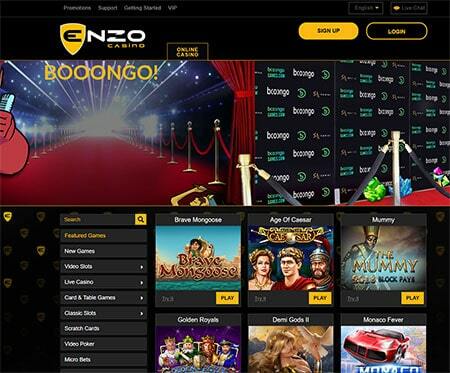 Enzo Casino is willing to go any length to ensure that they offer players the best games. Just recently, they announced that they have successfully partnered with Boongo to add to their list of game developers. The result of these partnerships is seen in the categories of games that they have listed out to include Action games; Live casino; VIP games; scratch cards; micro bets; video poker; video slots and several others. Each of these categories of games has several numbers with slots taking the lead. Also, Enzo Casino has quite a number of games in the live casino. Hence, you can be assured that you will be getting the best. This is one of the major spotlights of Enzo Casino. The platform seems to be very generous in the quality of welcome package that they have in stock for every new player. Enzo Casino offers a massive 150% welcome bonus up to a maximum of €1500. Hence, when you make a deposit of €500, you would receive an additional €750 making that first deposit a massive €1250. Likewise, deposit €20 and you will receive a total of €50. It is very important to note that this is a one-time bonus. hence you may want to make the most out of it. The welcome bonus must be wagered 33 times (deposit + bonus amount) before any request for withdrawal can be made. Of course, meeting the wagering requirement is optional just as long as you want to also forfeit the welcome bonus. Find all the best promotions at new online casinos. There are not many other promotions available at Enzo Casino after that generous welcome bonus. However, they still have a few tricks up their sleeves. Payment method deposit bonus: There is more than just making deposits at Enzo Casino. In addition to the huge welcome bonus offer, they also offer some extra bonuses for using some selected payment methods. Hence, enjoy a 15% boost on your deposit when you make payments using Ukash; Sofort; Giropay; Neteller; PostePay and Skrill. Only deposits of €20 and above are eligible for this promotion. Also, this bonus comes with a wagering requirement of 25 times. The VIP Program: High rollers and loyal players are not left out as they have lots of rewards to enjoy. Contributions towards the VIP scheme begin from your very first deposit and it never ends. The VIP program is a special promotion that rewards players with special bonuses and gifts that vary from one VIP level to the other. Support begins from the FAQ section where they have taken time to provide answers to a list of some commonly asked questions. Do you have questions about your account? What would you like to know about banking, making deposits and withdrawals? Do you have questions about security and legality? What about technical challenges? Answers to some of these questions have been provided. However, if you are not satisfied, getting in touch is quite easy. Enzo Casino offers you lots of options that include email, telephone as well as live chat. The telephone lines are open between 9 am and 10 pm daily while the live chat is available anytime. This is a massive boost as they are always available to take care of the challenges of their players. This is another area where Enzo Casino has done so well. The platform has more than 15 payment methods. Bitcoin; Skrill; Paysafecard; VISA; Maestro; Neteller; MasterCard; Ukash; Sofort; PostePay etc are some of the available methods. The minimum deposit amount at Enzo Casino is €10 while the minimum withdrawal amount is €100. Similarly, they only allow a maximum withdrawal of €5000 in one month. The withdrawal speed currently varies from 3-7 days depending on a lot of factors. Generally, the withdrawal speed for new players often takes a long time since more time is needed for verification. However, older players get to enjoy a relatively faster payout speed than newer players generally. Read our casino payment guide to get in-depth knowledge of payment solutions. The final remarks about Enzo Casino have its good and bad sides. The platform has a very lovely design and feels that makes it quite inviting. Likewise, Enzo Casino currently has in stock more than 500 games. That number is quite a lot and should take care of the needs of players who love variety. Also, another key highlight of the platform is the welcome bonuses. With as much as €1500 up for grabs, it makes the platform a popular destination as players always love bonuses. However, the bonuses won’t matter if you cannot meet all the requirements that accompany these bonuses. The fact that the platform is licensed by just the government of Curacao makes this even more difficult. Another notable lax in Enzo Casino is the fact that they do not have games from some top developers such as NetEnt and Microgaming. For the latest of the latest in the gambling world be sure to check out the News section.